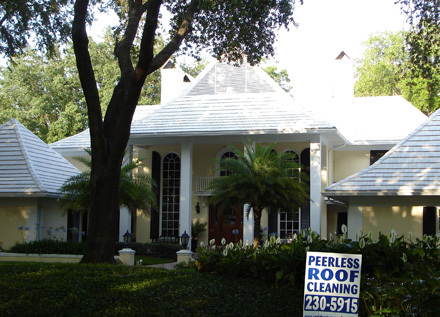 Whether you are a homeowner or the manager of a large business or HOA, Peerless Pressure Washing in Tampa is the only roof cleaning company you will ever need. We are a family-owned, licensed and insured business with 15 years of experience, and we use only the gentlest methods to guarantee the best cleaning of your roof without compromising its integrity. We can do this because we are a roof cleaning company that understands what many of our competitors do not: most of what plagues home and business roofs are living things such as algae and mold. Accordingly, we treat them with algaecides. Other companies treat them as dirt and debris, and their high pressure hoses simply rinse them off the surface without killing them or addressing the growths under tiles. Cleaning the same day you call us when time allows, which is more often than not. Free before and after digital pictures to document work. No use of high-pressure hoses, which can loosen, lift or break tiles and shingles. Use of a special pump with a 50-foot reach, enabling us to stay off roof tiles, which can break when stepped on. Use of a special gel, “Peerless Punch” which is custom-blended for your roof. Continued protection against algae and mold after treatment. Continual monitoring of run-off to guard against damage to plants, windows and siding. A one-year guarantee. If mold or algae grows back in the year following our service, we will clean your roof again for free. Contact Peerless Pressure Washing today for more information on our roof cleaning company. We are happy to serve you in Tampa, Clearwater, St. Petersburg, Brandon, Hyde Park, Boyette, Avila, and beyond. We take commercial jobs all the way to Orlando and along the Interstate 4 corridor.